THE capital has not looked so good in decades. Baghdad’s restaurants have had fancy face lifts. New malls seem to be opening every month. Cranes motionless since Saddam Hussein’s fall in 2003 are moving again as rich Iraqis have begun to invest at home instead of squirreling their takings abroad. Huge billboards of frowning clerics have been replaced by neon advertisements of unveiled smiling girls. Rockers pack an open-air peace festival on the bank of the River Tigris.Baghdad’s security has improved markedly since the jihadists of Islamic State (IS) were repelled from the city’s gates in 2014. But the city’s revival is under threat again, this time by rivalry between America and Iran and their proxies. Inside the Green Zone, Baghdad’s government enclave, Brett McGurk, America’s regional envoy, and Qassem Suleimani, commander of the Quds Force, Iran’s foreign legion, are marshaling their allies. Each is trying to shape the formation of a ruling coalition to his taste, following Iraq’s messy general election in May. Iran wants a “Shia house”—comprising more than 200 of the parliament’s 329 members drawn from a range of Shia parties—to run the show. Mr McGurk wants to have the reins held by a cross-sectarian coalition of Kurds and Sunni Arabs led by Shia “nationalists” less beholden to Iran. Mr McGurk’s would-be coalition, called Islah (“Reform”), has some 145 seats. General Suleimani’s rival bloc, known as al-Bina (“Reconstruction”), has 109 or so. Neither has the majority required to choose a president and prime minister. Political tensions are turning violent and spilling out of the Green Zone. Though American and Iranian commanders battled in tandem against IS, they are now at loggerheads. On September 6th mortars landed near America’s embassy in Baghdad; its consulate in Basra was later struck, too. These were the first attacks by Shia militias on American targets in Iraq since 2011. Two days later Iran fired missiles at a Kurdish base in Koya, an Iraqi town close to its border. This was reportedly the first salvo fired by Iran at Iraq since the long war between the two countries in the 1980s. 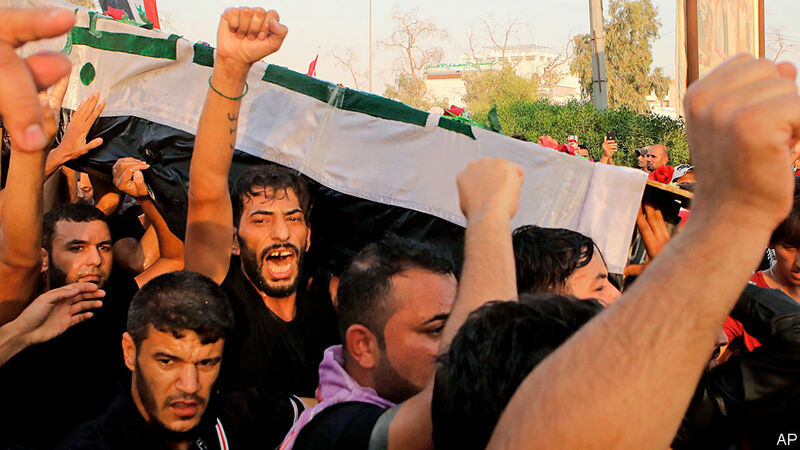 Even more dangerously, Iran is flexing its muscle in Basra, Iraq’s neglected second city, which lies close to the Iranian border. It plugged rivers supplying the city with water and cut its electricity. Locals protested by blocking roads to Iraq’s giant oilfields and only port, which provide 90% of government revenues. Security forces attempted to impose a curfew by shooting protesters, but only inflamed their ire. In a four-day rampage, they torched government offices and the Iranian consulate. This should have alerted the politicians in Baghdad. After all, the last time they bickered after another inconclusive election in 2014, IS fighters swooped into Mosul and much of northern and western Iraq, igniting three years of war. Haider al-Abadi, the caretaker prime minister, has sought American backing for a second term by suspending Abu Mahdi al-Mohandes, Iran’s man commanding the Popular Mobilisation Committee, which oversees the country’s plethora of militias. Mr Abadi has also promised to abide by American sanctions on Iran’s reeling economy. He has told Iraqi banks to stop dollar transactions with the country, thus blocking a prime conduit for foreign currency. If America does not grant a reprieve, say Mr Abadi’s officials, Iraq will stop importing an array of goods, including fuel, from its eastern neighbour by November. Those Iraqis who see Iran as their chief ally are fuming. After all, Iran was the first to rush to Iraq’s aid when IS closed in on Baghdad. Hoteliers in Iraqi cities hosting Shia shrines bemoan the recent dearth of Iranian pilgrims. “We’ve had no bookings since June,” says a hotel manager in Najaf. But Iraq’s nationalist camp is just as feverish. “Iran bara, bara!” (“Out, out, Iran!”), chant supporters of Muqtada al-Sadr, a Shia cleric who is popular among the urban poor. His bloc won the most seats in the election. Sadrists ripped down portraits of Ayatollah Ali Khamenei, Iran’s supreme leader, to whom many of Iraq’s militias are loyal. Massing for Friday prayers in Baghdad’s vast slum known as Sadr City, they castigate pro-Iranian militia leaders, whom they once cheered for repelling IS, saying they are worse than Saddam Hussein, the blood-drenched former dictator. In past crises Iraq’s senior Shia clergy in the holy city of Najaf, such as the now ailing Grand Ayatollah Ali al-Sistani, would have mediated. But their authority has waned. The non-aligned Kurds have watched from the sidelines. Few influential voices urge compromise. Militiamen and politicians alike predict a return to assassinations and a Shia-on-Shia civil war. And after months of merciful calm, the thud of car-bombs can be heard again on highways out of Baghdad.